With 19 of 19 precints reporting in the Ponca City School Board election, Dr. David Kinkaid has taken 75.46 percent of the vote to retain his seat on the board. 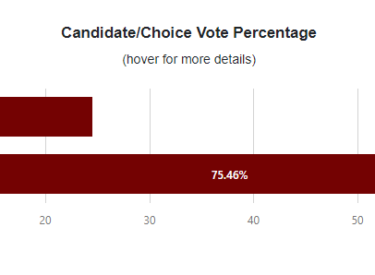 Challenger Amanda Porter-Cain netted 24.54 percent of those voting. Kinkaid tallied 861 votes, including 16 absentee mail ballots, 37 early voting ballots, and 822 election day ballots. Porter-Cain had 280 votes, including 5 absentee mail ballots, 9 early voting ballots, and 266 election day ballots. Three of the precincts in the race were outside of Kay County, including one in Noble County with no votes cast. Two precincts in Osage County each had one vote — one going for Kinkaid, the other for Porter-Cain. These are unofficial results until certified by the State Election Board on Friday.